I was out on the sidewalk picking a big chestnut tree that I helped plant in 1982. It is more like hitting the chestnut tree with a long bamboo pole and knocking the nuts off and they fly everywhere. People drive or walk by and many smile. When I saw a guy driving by in a worn out pickup truck look out at me and smiling all friendly like, I thought everyone loves a farmer. I think it is true. Because of our need to eat to live (unless you are a breatharian) I think somewhere deep inside us we appreciate those who grow our food. I actually think that people who are anti-immigrant these days ignore the fact that a lot of our food is harvested by people who cross our borders for work, a lot of it farm work. These days as people start waking up and figuring out where their food comes from, maybe they are thinking of our farmers more than they used to. I know I have been appreciating farmers more since I have started trying to grow a lot of food myself. This weekend I felt like I got real exhausted with the work I was doing (maybe it was heat exhaustion). Just like we want our food system to be sustainable, our lives need to be sustainable too. 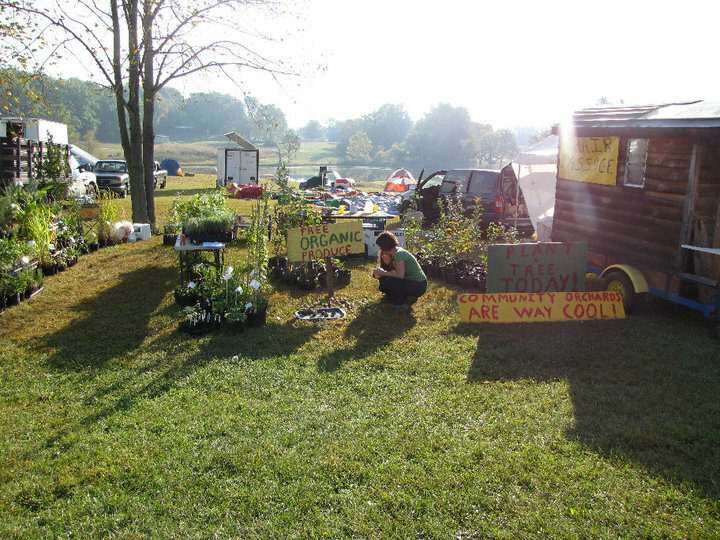 I am aware that the Free Farm Stand is not really sustainable in its current form and I am thinking hard about how to make things work better for myself. Although it isn’t a one person show and we have an incredible number of great volunteers, I still feel like I am doing way too much to keep things going the way they are now. This week we were a little short handed, especially towards the end. We actually didn’t have a lot of hecka local produce, but there was a lot of left over farmers market food and the amount that came at 2:30pm was almost unreal. In fact I have to cut this blog short and process some leftover soft fruit we had. I may be getting some new interns soon to help run the stand. We could also use a photographer so this blog can have some photos (we miss Cristina not only for her beautiful energy, but her photographic eye). It looks like Produce to the People reached their kickstarter goal of raising 10 grand and I am really happy about that. Lauren just wrote to me and said she is looking for people that have access to a vehicle and may want to drive up to Lakeport (near Clear Lake…maybe a few hours from here) to help pick a large pear orchard (this is the orchard that people picked last year). Two possible dates are Sunday the 3rd or Saturday the 9th. If she finds drivers then we will look for people who want a ride. I signed up for the Free Farm Stand to be part of the 10-10-10 day which is part of the of 350.org’s 10.10.10 call to action for solutions to climate change. I mainly signed up because we are doing the 10-10-10 day every Sunday so why not join. I would like to issue a challenge that day to get more local produce that day from San Francisco gardens or fruit trees. 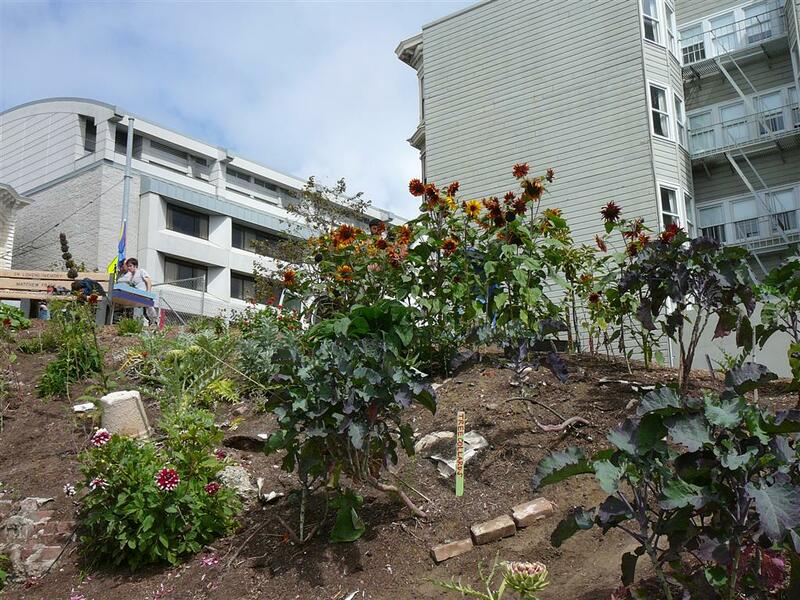 People should bring some surplus produce to share…if you don’t have a garden maybe check out a community garden and talk to them about sharing any surplus produce that people are not picking. I wasn’t at the free Farm Stand yesterday because I was at the Free Farm working with an architect and others developing a master plan for the site and more specifically seeing if we could come up with plans for a greenhouse, shed, and multipurpose space.. I do know that the van was loaded with forty boxes of figs that were left over from the Ferry Building Farmers market and a lot of Acme bread. Plus we had the usual summer produce from the Free Farm. I can report on the Free Farm. We are rapidly moving into fall and the harvests are getting smaller. Most of the collard greens we planted got eaten by the Cabbage Butterfly caterpillars and I also think we might have Cabbage Loopers too. I just learned from Pam Pierce’s excellent book Golden Gate Gardening, that the Cabbage Looper is the larvae of the Brown Moth and it moves like an inch worm or loops. The Cabbage Butterfly larvae is a caterpillar that looks almost the same,it just crawls. Anyway we have been kind of laid back about pests so far in this farm and as a result our crop is mostly gone. I think we need to put reemay plastic (spun polyester cloth) over the baby seedlings in the future). One of the accomplishments of the farm, besides growing 1,849 pounds of produce in 6 months time, is that more wildlife has started visiting the site. Besides these pesky moths and butterflies, hummingbirds are visiting and I just took a photograph of a native bee that lives at the farm and is nesting in the sandy paths. 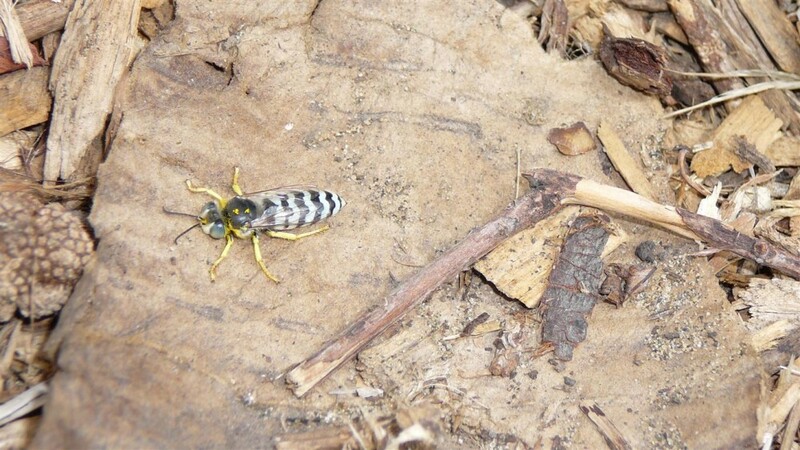 She is called Bembix sand wasp or digger wasp. We are also building soil with the tons of manure we have brought in and the beautiful compost we are making. I also have been loving the visitors that walk in or come by for some produce on Saturday. On Saturday I joined a conversation Pancho was having with Mohammed, a man who lived nearby who is from Morocco. When I told him my name he told me a something Mohammed said. That if you are planting a tree and the end of the world comes, keep planting the tree, don’t stop. I read this quote online which is pretty similar: When doomsday comes, if someone has a palm shoot in his hand , he should plant it. It seems every week we get new helpers too. They come and go and come back again and they all enrich our lives as they enrich the farm and we all enrich each other. I just read an interesting article in the New York Times (http://www.nytimes.com/2010/09/12/magazine/12food-t-000.html) about how summer internships on farms has become very popular with young people these days and the interest in farming has really grown. Like us, these farmers have been depending on this labor volunteer force to really make their farms successful. I would really love to have an urban house to put up some of our visiting volunteer crew. Here is a beautiful article by Jason Mark who helps run Alemany Farm: Bullets and Beets: Murder at the Farm Stand (http://food.change.org/blog/view/bullets_and_beets_murder_at_the_farm_stand). It made me think about what we at the Free Farm are doing. Jason says, “Distributing food in a low-income area is a nice initiative for an urban farm —and nice is about it. The Alemany residents that pick up organic fruits and vegetables at the stand appreciate and value the food; I know this because they’ve told me, and because they keep coming back. Yet our modest accomplishments to boost food security are wholly inadequate to address the crisis of violence that grips a poor community. No one is under the illusion that growing beets can stop the bullets.In trendy, foodie San Francisco, however, many people seem more interested in the beets — and would prefer to ignore the bullets.” Our situation at Gough and Eddy is different and I am not aware of the bullet kind of violence in our neighborhood. There is the poverty kind of violence and hardship, and food insecurity. There is also loneliness, isolation, and mental craziness that many struggle with. People come by all the time wanting to make some kind of connection with what is going on at the farm. Sometimes it is just curiosity or wanting some fresh vegetables. Sometimes people on the street walking by just want to talk and we seem to be a safe space for that to go on. I think any project that serves the poor and disfranchised should contain a component that helps serve the spiritual needs of the people seeking help. Just being closer to nature or gardening can often provide that kind of comfort. Why should we build anything besides what we have on site? Most important item to build? Which other groups can we learn from? How do we need to distinguish ourselves from other groups? What does the neighborhood need that we can provide on this site? What can be a spiritual aspect of our design? What could be an interfaith aspect of our design? What should be the qualities of the design/landscape/architecture/construction? What are the important elements of a masterplan for this site? How should the edges of the site be designed? What about parking and road access? We did at the end get into some specifics of shed and greenhouse/multipurpose space design. We came away with the basics of a master plan for the site and plenty of projects we could work on in the future to implement the plan. I think our next month or so will be exploring what we kind of greenhouse/shed can we get built on the site and moving ahead with that project. “… it would reduce the open space used by small kids to run around and play. …concern about flies and odors from the fruit on the ground. There is also a good possibility that fallen fruit could attract more rodents that already can be found in and around the compost bins. Also, the open space feel of the park would be lost if the area behind the gazebo is fenced off.